Protesters gather to condemn a Confederate monument in Knoxville, Tenn., last August. This week, the state's lawmakers abandoned — for the second time — a resolution denouncing neo-Nazis and white nationalists. 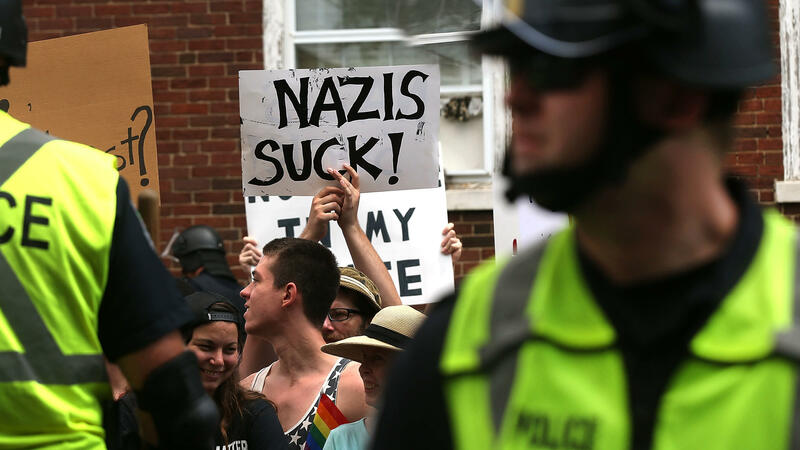 For the second time in less than a month, Tennessee's GOP state lawmakers have declined to proceed on legislation condemning white nationalist and neo-Nazi groups. On Monday, roughly three weeks after a Democratic-sponsored resolution died in committee, GOP state Rep. Ryan Williams quietly requested that the Republican version of the measure be withdrawn. The new version was nearly identical to the one put forth by Democratic Rep. John Ray Clemmons in the days immediately following the white nationalist rally last August in Charlottesville, Va. After those demonstrations descended into deadly violence, Clemmons' brief resolution stated that "we strongly denounce and oppose" the beliefs underpinning white nationalism — and urged law enforcement to recognize these and neo-Nazi groups as terrorist organizations. That measure met its end before it could pass the State Government Subcommittee, having failed to receive any Republican support. GOP lawmakers in the committee initially offered no explanation why, but they later described the resolution as a trap designed to embarrass them, rather than actually win passage. "Part of being a great legislator is knowing your bill, knowing the committee that it's going through, working the vote and asking for a motion and a second before you get there," Williams said then, according to Nashville Public Radio. "That's what policymaking is. It's pretty simple." House Majority Leader Glen Casada told the member station that if Clemmons should try again, the GOP caucus would "definitely second it, motion it, support it, vote for it" — an assertion Clemmons responded to with blunt disbelief. "Glen Casada is full of crap," Clemmons told Nashville Public Radio in an email. "Feel free to quote me." Yet the resolution did indeed appear destined for revival last week after Williams, who serves as the House Republican caucus chairman, introduced a second resolution identical to the first in every respect except one: It dropped the stipulation urging the designation of neo-Nazis and white nationalists as domestic terrorists. That revival lasted less than a week, though. The resolution was withdrawn from a committee hearing scheduled for Tuesday, by Williams' own request. His office did not immediately respond to NPR's request for comment. But in a statement given to The Tennessean, Williams explained that the "bill's caption was too narrow and couldn't be amended to incorporate additional feedback gathered from our members over the past couple of days." The newspaper noted that he did not clarify what, exactly, that additional feedback would have entailed. "I still believe it is important for our General Assembly to condemn groups that support racism and hatred," Williams said. "I look forward to working with members on both sides of the aisle on a future resolution which can meet the expectations of all of our House members, as well as the citizens of Tennessee."